The debate surrounding wild and farmed salmon is complex and often contradictory. The issues and arguments generally fall into three main categories: environmental concerns, contamination problems, and the heath concerns of eating farmed salmon. Farmed fish are most commonly raised in net pens in the ocean, usually in a protected area such as a bay or a cove. The environmental impact of such farms is still being studied, but pollution in the form of waste collects underneath the pens, especially in low current areas, impacting the habitat for other sea life. The food farmed fish eat contains wild fish, fish meal, and fish oil such as from sardines and anchovies, further depleting ocean stocks. 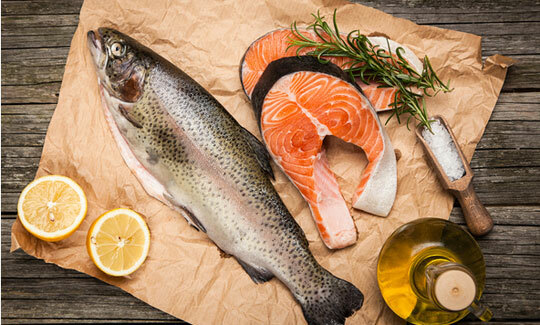 Studies have shown that it takes over a pound of wild fish to grow a pound of farmed salmon. It’s crazy to me that we would deplete our oceans of wild fish to feed farmed ones. Fish that escape are also a potential major threat to native Pacific salmon species. Escaped Atlantic salmon can survive in the wild, and though they will not reproduce with Pacific salmon, they compete for necessary resources. Overcrowded salmon pens pollute the marine environment and are susceptible to failing which releases thousands of contaminated fish into our waterways. Escapees can infect wild salmon with the viruses and/or diseases they carry. In 2017, a collapsed net pen off the coast of Cypres Island in the Puget Sound released over 260,000 farmed Atlantic salmon, nearly all of which were infected with Piscine Reovirus, a highly contagious and potentially lethal virus. A 2018 study demonstrated that PRV leads to debilitating disease in Chinook salmon, the primary food source of endangered Southern Resident orcas. Wild Salmon naturally derive omega-3 fatty acids from plant, algae, and plankton food sources. In farmed salmon, it is a part of their feed. Omega-3 fatty acids are considered essential to human health since our bodies cannot produce them naturally. Studies show that both wild and farmed salmon contain these fatty acids, and in some cases farmed salmon may have even higher levels. However, this is only one side of the coin. Much of the omega-3 fatty acids in farmed salmon can be unusable in the human body due to the accompanying higher levels of omega-6 fatty acids. A healthy ratio of omega-3 to omega-6 fatty acids is about 15:1, the average found in wild salmon. Farmed salmon average a 3:1 ratio. Because of the overcrowding in fish pens, disease and infestations is common, requiring heavy use of antibiotics. It’s estimated that farmed salmon are fed more antibiotics per pound than any other livestock—including beef and chicken–in North America. Farmed fish generally contain higher levels of PCBs than wild salmon, which is a toxic organic compound found in the food pellets. A study done by Norwegian scientists in 2013 warned that pregnant women and children should avoid eating farmed salmon because the types of contaminants detected in farmed salmon have a “negative effect on brain development and are associated with autism, ADHD, and reduced IQ. If our kids and expectant mothers shouldn’t eat farmed fish, why would the rest of us eat it? Fish is an important part of a healthy diet. But how healthy is the fish you are eating? Overall, wild salmon is better for the environment and for your own health. Lower levels of PCBs, more essential nutrients and less damage to the marine ecosystem are just a few of the benefits. This is why I stand by my viewpoint that farmed fish have no place at Duke’s. And again, I think the strongest argument for eating wild salmon is the simplest: it just tastes better! At Duke’s, we only serve 100% sustainable seafood, including wild Alaska salmon. Book a reservation at one of our six locations and taste the difference for yourself.